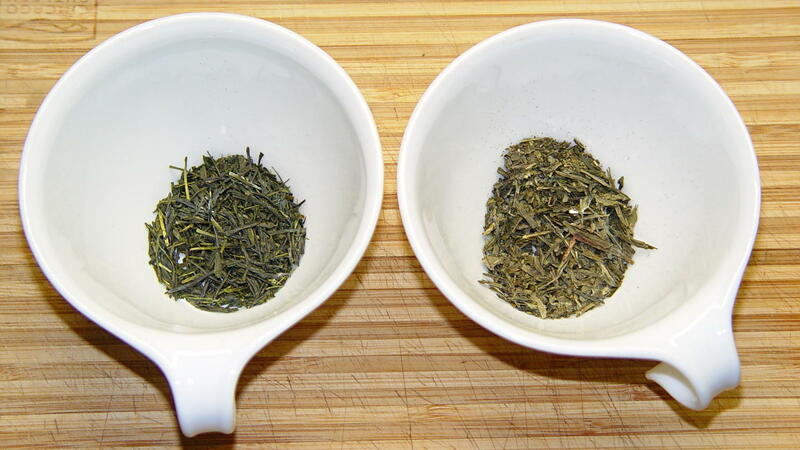 I recently ordered a pound of genuine Japanese Sencha Green Tea from Harney & Sons (who turn out to be a long bike ride away at the Millerton end of the Harlem Valley Rail Trail), having had entirely enough of the rather bitter Chinese Sencha from the local grocery store. Yup, Japanese on the left, Chinese on the right. The latter comes from the bottom of the container, hence the larger proportion of flakes, but it’s obviously different stuff. Based on the first few cups, the new tea has a much better taste. From what I read, the price of Japanese teas has taken a real beating in recent years, because everyone (else) fears Fukushima Daiichi fallout. My feeling is that a Chinese tea plantation could be downwind of Smiling Face Heavy Metal Refinery Complex Number 5 and you’d never know it. For reference, the Japanese Green Sencha was $40 for 1 lb delivered. This entry was posted on 2014-05-25, 07:50 and is filed under Home Ec. You can follow any responses to this entry through RSS 2.0. Both comments and pings are currently closed. One of these ingredients doesn’t go with the other two (choice of the tea or the caramel…) I guess it could be a way to sell off a supply of so-so tea. If I’m going to mess with a hot drink, I’ll start with coffee…. Mocha in the morning! I too like green tea but my favorite has some burned rice in it – it gives it a nutty flavor. I am currently drinking a Korean brand, Dong Won. Maybe I’m too cynical, but whenever they add a new ingredient, it always reduces their cost and rarely improves the result. E.g. Lipton presumably uses tea like on the right and then adds flavor balls (read: sugar) to make up for the difference. Or in other words, when you think you’re buying sugarless tea you’re getting sugar anyway. In the ingredients it’ll be indicated as “aroma”, but luckily new EU food regulations state that should change that by December 2014 at the latest. That aside, supposedly green tea will also be less bitter if you let the water cool down to 85° or so before you stick it in. I haven’t tried, because my Japanese green tea (which looks more like on the left) doesn’t taste especially bitter to me regardless. Of course it does taste slightly bitter, particularly if I leave it in for a while, but I like that anyway. Around here, that would be the second cup from the same leaves: definitely a wake-up call if I managed to sleep through the first cup. The directions say to steep it for a minute or two in 185 °F water. When I’m in the basement, the cup cools down to body temperature pretty quickly… not quite the same thing as either cool brewing or iced tea. Sorry, I meant 85°C. I just realized 85° in Fahrenheit would refer to a mere 30°C. I have no idea how you’re meant to know the precise temperature; I can only imagine tea purists use thermometers as if it were a chemistry experiment. The way I make tea is perhaps slightly unusual. Rather than using a tea pot, I use a giant tea mug. * After leaving the tea in the hot water for a few minutes (or many minutes, if I forget), I transfer the leaves to another cup with cold water. Sometimes I also like to mix some mint in. I used to dry e.g. mint and nettles from the garden, but living in the city I’ve resorted to buying a big bag of dried mint from an herb store. Usually, though, I just drink water. Actually a beer mug, or beer stein as I believe it’s called in English. I picked up four gargantuan Starbucks coffee mugs at a tag sale: 600 ml of brew keeps me occupied for quite a while. A long time ago, I used a 1/2 liter steinkrug as a tea mug. Stopped after I did a batch of Darjeeling black tea after dinner. Got an all-nighter out of that mug. That being said, because of the caffeine I’m thinking of returning primarily to the likes of mint, nettle, and fennel. It’s just a bit of a psychological obstacle: I think I can grab those plants from anywhere to dry them myself, so I’m not prepared to fork over any money for it like I might for foreign tea. But realistically speaking it’s cheaper to the same price and it’d last a long time as well, so in a way I’m being a bit silly I guess. I’m just talking about a few leaves of dried mint. For some variety you can switch between regular mint and water mint, or just go all (water) mint, assuming both grow near where you live or you can buy ’em dried for a fair price. I later learned this is called Moroccan green tea. My bad, according to Wikipedia water mint does not — or at least not naturally — occur in the Americas. But perhaps there are some nice indigenous mint relatives I’ve never heard of. The problem is though, in the city it’s not exactly obvious to just get those common plants. And if you see a bunch of abysmal nettle or something, who knows what kind of icky fumes it absorbed during its lifetime, or maybe if it was sprayed with some kind of pesticide by someone who doesn’t like ’em. And don’t you eat that yellow snow. I really like the smell of zuring while moving grass. Literally souring, but in proper English something like (sour) dock or sorrel. I don’t care too much for the flavor, but the varieties with nice round leaves are edible. Mostly their juice is great against nettle and mosquito stings.